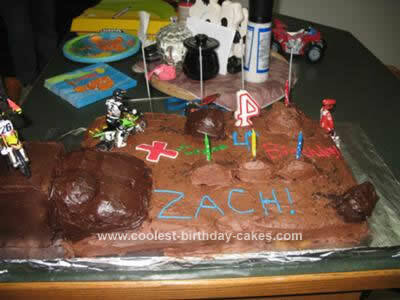 I made this Motocross Birthday Cake for my step son’s 4th birthday. 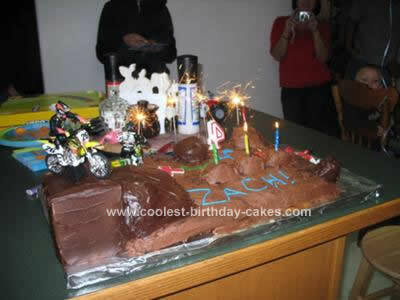 I used a 9×13 chocolate sheet cake for the bottom and used cupcakes cut in half to make the jumps. The ramp is just cupcakes piled up and cut down. The platform is actually just a box covered in icing, but you could use cake. I iced it with chocolate frosting. For a nice touch we lit the sparklers to be like fireworks although he was slightly scared of them at first lol.